The first Microsoft Office tip deals with something we all do a lot: selecting text in documents. The second tip shows you how to supercharge Undo and Redo. And my last tip is a reminder to use the always-available contextual menu. Hold down the Shift key to extend the selection contiguously; hold down the Command key to select non-contiguous words/sentences/paragraphs/cells/rows/columns. 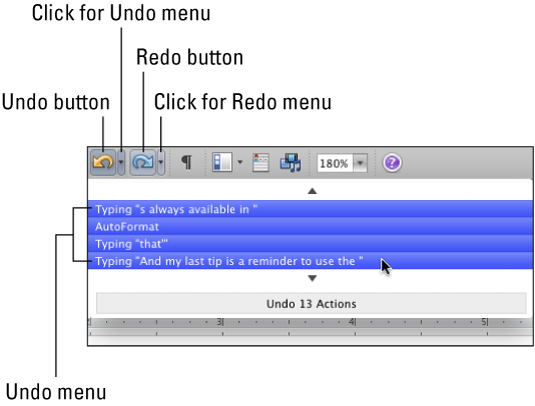 All of the Office applications have virtually unlimited Undos (shortcut: Command+Z) and Redos (shortcut: Command+Y). That’s cool but the Undo and Redo icons in the Standard Toolbar of all of the applications (except Outlook) have pop-down menus that list all of the actions you can undo or redo. Don’t forget the contextual menu, available by right (or Control) clicking on a word, cell, document, object, or almost anything else in a document. It usually contains commands that are only useful in the context of what you right (or Control) clicked, and can save you time and effort.